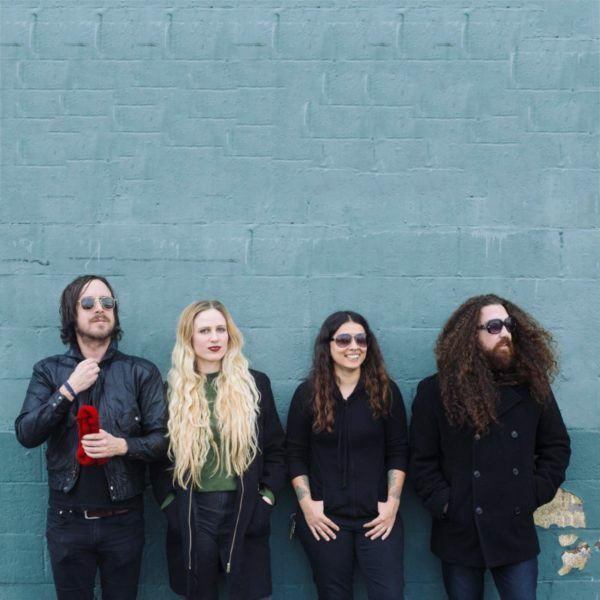 TV Heads is a four-piece band born in the artistic crucible of the Bay Area and raised in Los Angeles on a steady diet of post-punk riffs, raw vocals, and electro textures. As a follow-up to their recent West Coast tour, TV Heads are setting out again to play a group of shows in the Southwest US in continued support of their debut EP, “Total Fucker”, out now on OIM Records. TV Heads is composed of Sean Galloway (The Shimmies/Ave Grave) and Angelica Tavella (Nyx), who share duties on vocals, guitar, and synths, in addition to bassist Vince Gutierrez (Samvega/Crook) and drummer Jessica Lankford (Peba Luna). Galloway, Tavella, and Gutierrez are long time musical collaborators in various bands, tours, teaching at youth summer band camp and even performing in drag musicals. While Gutierrez and Tavella used to trade off on drum duty in the band’s early days, Lankford officially joined the band after their last tour. A band cut from a distinctly creative cloth, even their day jobs ring musical as Galloway scores documentaries, Tavella works for Ableton, Gutierrez is a music festival producer, and Lankford is an assistant to a professional composer. TV Heads’ EP, “Total Fucker” (a term of endearment the band mates use for one another) was produced by Jeff Saltzman (Department of Eagles, The Killers, Blondie) who worked closely with the band to achieve a balance between verses with delicate melodies and choruses that take the mix into the red. The result sounds like a mix somewhere between indie mainstays Thao and the Get Down Stay Down and heavier elements of Jeff Buckley’s and/or Smashing Pumpkins’ catalog. Gritty synths, overdriven amps, and lush vocal harmonies soar atop urgent rhythms, creating a sonic package that teems with life and breathes entirely unlike their plastic molded contemporaries. Not bad for a bunch of total fuckers.